– NCW ring announcer “Toxic” Tom Warren welcomed everyone to Aftermath, and then announced the new Commissioner “Dynamite” Doug Summers to ringside for his State of NCW Address. 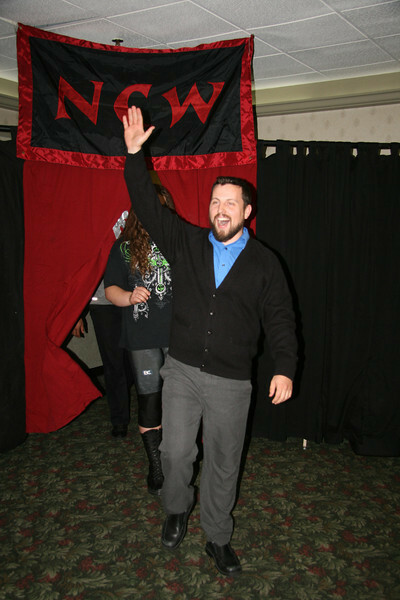 Before he began Summers welcomed the entire NCW roster to the ring to directly address his staff. Doug’s first order of business was officially signing his two young students to NCW contracts– revealing their true identities as “Terrible” Tony Caruso and “The Beast” Brandon Behm, with Doug stripping Dean Livsley of the “Beast” moniker. Doug then rechristened himself “Dastardly” Doug Summers, embracing the jeers from the fans while officially proclaiming his crew the Inglorious Dastards. Finally Summers also promised that at Total Elimination Buddy Romano would return to NCW, teaming with his group against Livsley’s team of the BLT and the Loomis Brothers. As the NCW roster returned to the locker room, Summers kept Mike Paiva back for the opening contest, robbing “The Original Showoff” of his customary entrance. – “RIOT” Kellan Thomas w/ Kepler d. “The Original Showoff” Mike Paiva after rolling through on Paiva’s attempted ‘sleazeball special’, trapping Paiva’s shoulders to the mat for the three count. – NCW Tag Team Champions the Loomis Brothers d. Maniacally Twisted [“The Twisted Hatter” Alex Creed & the Shadow] w/ Sean Feeney when David Loomis hit the bicycle kick on Creed. – “The Hard Rock Hellraiser” Todd Sople d. “Jiving” Jimmy Capone and the Roadblock in a Triple Threat Match, with Sople building up an impressive win/loss record this Season. 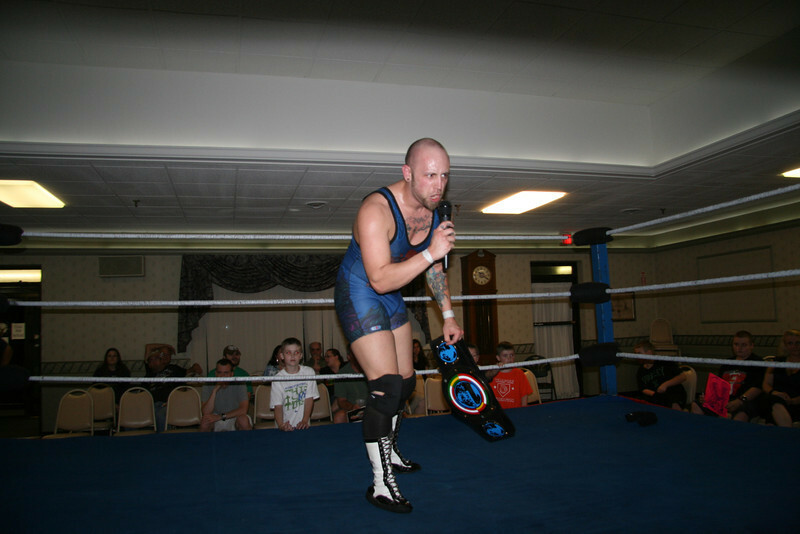 – NCW New England Champion “Simply God’s Best” GA West w/ Doc Ozone d. Mike Graca Jr. in a great match to retain the New England title, barely getting by the tenacious rookie. Following the match GA West made an unofficial challenge to his former rival JT Dunn, the mentor of Graca. – By keeping Dean on the NCW roster, Summers forced Livsley to compete at NCW Aftermath, taking on Michael Tootsie Esquire. With MTE coming to the ring in street clothes, the former Connecticut Champion believed he had no reason to gear up against the former Commissioner. – Dean Livsley d. MTE in quick fashion, completely obliterating Tootsie. – The Inglorious Dastards [“Dastardly” Doug Summers, “Terrible” Tony Caruso, & “The Beast” Brandon Behm] d. Rob the Giant, Steve “The Turtle” Weiner, & the Lumberjake in Six Man Tag Team action when Buddy Romano returned to the ring, assisting Doug Summers against Lumberjake and allowing Summers and company to hit their triad of finishers on the former Tag Team Champion. – “The Portuguese Sensation” Ruy Batello d. “The Maniacal” Jack Krueger w/ Sean Feeney with ‘ruination’ in a hard hitting match-up. Krueger attempeed to eliminate Batello early on with his steel chair, but the former Heavyweight Champion was able to turn the tide despite interference from Feeney. – Scotty “Won’t Die” Vegas d. “The Juice” JT Dunn by count out in a brutal display of athleticism, winning the NCW Heavyweight Championship on a tecnicality stemming from a stipulation that was added last year during Dunn’s series of matches with Buddy Romano, where the title could potentially change hands via count outs or disqualifications. A dejected Dunn remained at ringside following the match, unable to process how Vegas shamefully stole the championship. For exclusive photographs from this event check out Picture Dave’s photos here. Previous PostCruel Summer: The Aftermath of AftermathNext PostTONIGHT NCW Debuts in Westerly, RI!